You know when you see pictures of people, like Kim Kardashian, who have absolute perfect silky hair with zero breakage or fly aways? Yeah that’s not me haha. I will say upfront that I was not blessed with perfect hair! I can definitely say that after taking more of an interest in hair care – my hair has dramatically improved in the last couple of years! In this post, I would like to share with you the products that I am currently using and how I use them. Matrix Biolace Shampoo & Conditioner – I personally love this range of shampoo and conditioner. After use, I can and do really feel the change in my hair. I buy these in a pack from Hair House Warehouse (in Australia) for about AUD $45.00 and these last me over 6 months. I prefer the purple ones – they make an amazing difference in the look and feel of my hair. I am currently using the colour care as I have recently attempted a little bit of the ombre look and use this to help lengthen the life of my colour! It may seem like a steep cost for shampoo/conditioner but for some reason I find that my scalp reacts to cheaper shampoos. I am not exactly sure what the ingredient is that my skin reacts to but I have had no troubles whatsoever with these products which is why I am sticking to them! I used to wash my hair every.single.day which totally dried out my ends and made me go through shampoo like there was no tomorrow. I now only wash my hair every 3 or 4 days and have noticed such a huge difference in the quality of my hair by cutting down my washes! Plus now my shampoo and conditioner last FOREVER. Moroccan Oil Hair Mask – This is one of those cult favourite products that everyone has heard of everywhere. Every time I buy a hair mask, I like to try something different and have not really found one so far that I dislike! If you are putting bleach in your hair – I would recommend to do one of these deep conditioning treatments per week. If you are not putting any colour in your hair – I would recommend at the very least to do one treatment per month. Ideally, a little more often! Hair masks are just amazing products for hydrating and nourishing your hair and adding a little bit of lost moisture back into your hair. If you are using these correctly and leaving them in for long enough – you will most definitely see and feel the results. The Morroccon Oil hair Mask gets the job done for me and it is a hair product that smells absolutely amazing! Macadamia Oil Spray – This is a super light weight version of the regular Macadamia Oil as it comes out in a spray form. I purchased this as I do have pretty thin hair and wanted an oil that wouldn’t weigh my hair down all that much. Funnily enough, I do actually prefer the regular tip-out oil! For some strange reason it just makes my hair feel softer and more smooth. This retails for about AUD $45.00 in Hairhouse Warehouse and I have had this product for almost 12 months now so it is quite pricey but lasts ages and I still have plenty of product left! I just spray a little bit of this into the ends of my hair whilst it is still wet after getting out of the shower. I will do this pretty much every time and brush it through. I will brush this through about three quarters of my hair – completely avoiding the roots as you don’t want your hair to look oily! MUK Leave in Conditioner – I actually really enjoy this product! The ends of my hair can get a bit dry and as I have used just a little bit of bleach in my hair – I like to do that little extra bit to keep my ends as hydrated as possible. I will use this shortly after the Macadamia Oil and will just basically flip my hair upside down and spray all along the last quarter of my hair and brush it through. Again, I wont brush it all the way up to my roots as I want to avoid that oily look! Tresemme Heat Protectant – This is by fair my most FAVOURITE heat protectant that I have tried. Basically because the spray that comes out of this bottle is so fine which makes it SO easy to brush out and evenly distribute through your hair. Another thing that I absolutely love about this product is that it doesn’t make my hair sticky. I have no clue why but I have found that a lot of heat protectants have has a sticky texture to them! Such as the Redkin (which is triple the price). This is a pretty self explanatory product – I will use it before blow drying my hair and if I decide to straighten it that day – I will spray just a little more in my hair before using another heat tool. Batiste Dry Shampoo – Oh how I love this product and do not know how I lived without it for the first 20 years of my life! Dry shampoo has been a lifesaver for my hair as it has allowed me to stretch out my washes from every single day to every 3 or 4 days. I am convinced that this product is magic. All you need to do is spray the product into your roots and then brush it through and voila! The oil has disappeared. Basically the finely milled powders in this product are what soaks up the oil. For a cheaper alternative you could use baby powder but for some reason, this makes my hair go all static-y. Do you use any of these products? 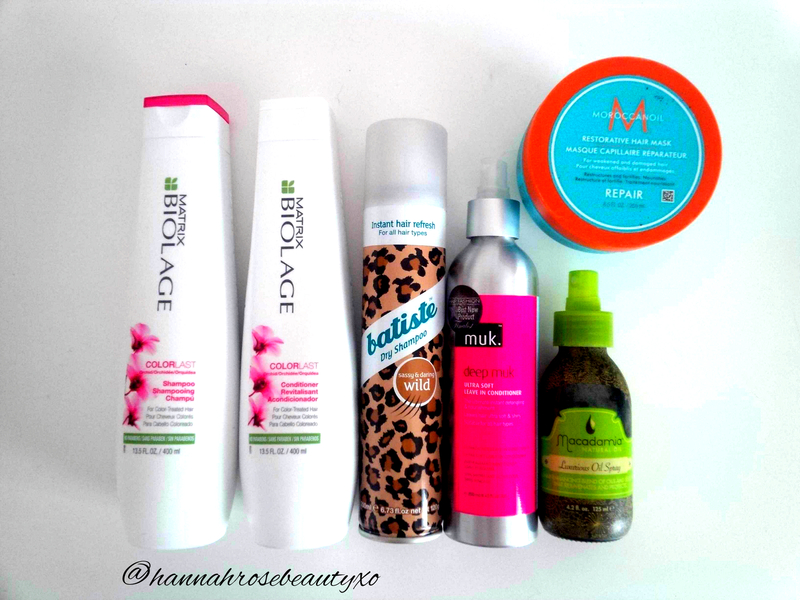 What are your favourite hair care products? Do you have any recommendations? Let me know your thoughts! I love the Batiste dry shampoo, hands down one of the best dry shampoos. Plus, the price is so low its hard not to love it! That dry shampoo is one of the best out there! Nice post.